An aluminium triangular square, with one right angle and two 45 degree angles. Used for general squaring when marking out and by some people (reputedly) for obtaining roofing angles. An aluminium triangular square, with one right angle and two 45 degree angles. 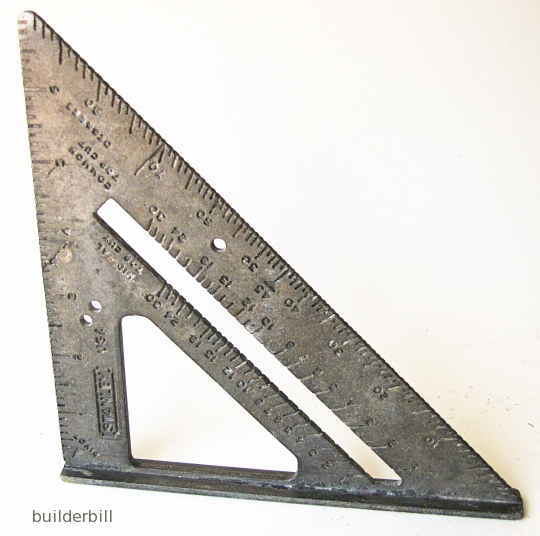 Used for general squaring when marking out and by some people (reputedly) for obtaining roofing angles. The trademarked tool put out by the owner of the copyright. What you see above is a great little general purpose square. It is just about indestructible in work site conditions and it will not get out of square like many other types. This particular one is made by Stanley (under license I guess), and not an original Swanson square. (Who cares). I don't want to offend any of my US readers, but what you do not see here is the answer to all your roofing problems. Quite frankly why mess about with a toy like this for roofing when there are better and easier ways to do it. I would hate to lose this square, it is a very useful tool. 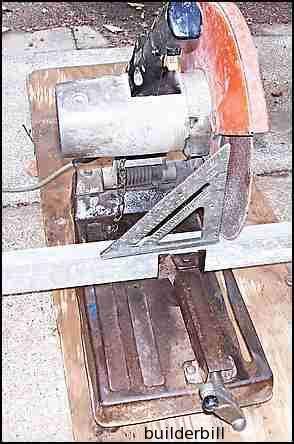 At the right one of it's regular jobs is to check that my old chop saw is set up to cut square.